An existing pool had to stay put. 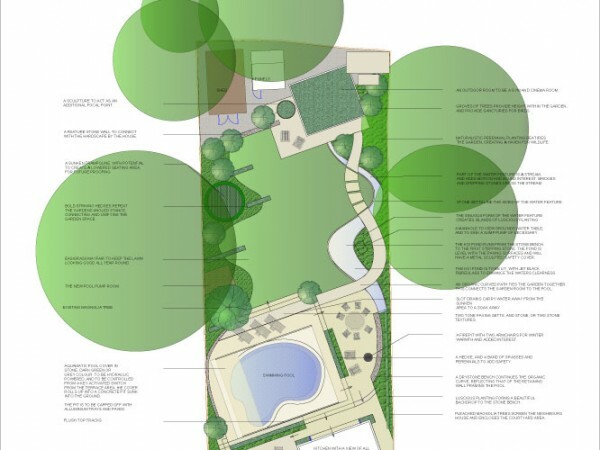 The brief was to create a contemporary country garden which incorporated the pool successfully. A main feature of the garden was a sinuous stream leading from a garden room to a Koi pond. Sawn Yorkstone and Vande Moortel pavoir bricks were specified. Multistemmed Betula Utilis trees and intersecting hedges were used to lead the eye around the garden, and to create a sense of order and seclusion.